This year we will be touring a BRAND NEW Forum Theatre show to schools across the GTA! From acclaimed playwright Luciano Iogna, IN YOUR HEAD takes us into the relationship of Rayna and her brother Sam as they deal with the increasingly complicated world of high school and “growing up.” How can they be there for each other? Is there anyone else that can help out? IN YOUR HEAD is about the importance of mental health allyship and how we all have a role to play in combating mental health stigma. For the first time ever, we are offering our “LIGHTNING FORUM” presentations to schools! Lightning Forums are our scenario-based theatrical presentations that gives you more choice in topics and scheduling while maintaining the high quality of engagement our shows are known for. Available topics this year include: anti-bullying, anti-discrimination and inclusion, building healthy relationships, and gender-based harassment and violence. After great feedback from schools last year, we are pleased to offer our customizable Forum Theatre IN-CLASS WORKSHOPS again this year. These are a great economical option for teachers who want to give their students a more hands-on look into the creation of theatre for change from master facilitator and MCT Artistic Director Simon Malbogat. 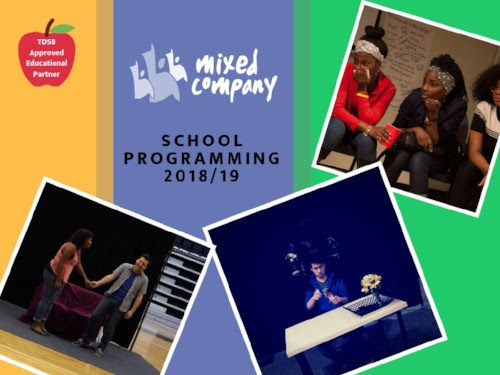 Contact communications@mixedcompanytheatre.com to bring MCT and Forum Theatre into your classroom! For more information, please visit: http://www.mixedcompanytheatre.com/season/ "